The National Instruments PCIe-4065 6½-digit digital multimeter (DMM) is the first DMM for PCI Express in the industry. It is a low-cost board for the measurement of voltage, current, and resistance, or for diode test. Along with the NI PCI-4065, it is ideally suited for OEMs, educational laboratories, or other cost-conscious test and measurement facilities. With ±300 VDC/Vrms of isolation, current measurements up to 3 A, and 2 or 4-wire resistance measurements, the NI 4065 DMMs provide a complete multimeter solution for basic 6½-digit measurement needs. For higher-performance requirements, consider using NI 407x PCI and PXI FlexDMM devices. These devices combine industry-leading accuracy and resolution at 6½ and 7½ digits with 1.8 MS/s digitizer capability for faster sampling rates in production test environments. 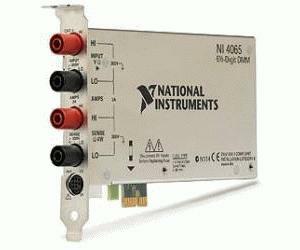 You can easily integrate NI 4065 DMMs with stand-alone switching using the 4 or 12-slot USB Switch Mainframes from National Instruments. You can configure these switch systems, controllable from any available USB port on a desktop or laptop PC, with more than 50 available SCXI switch topologies. Switching offers a simple method of channel expansion for data-logging systems based on NI 4065 DMMs.